In this episode, Minette and Brad dive into how important giving thanks is to our productivity. Gratitude can create a powerful ripple effect in the workplace (or at home – between the two of us) when we tell people how much we appreciate them they are happier, and happier people are more productive – go figure ! Keeping a gratitude journal is the best way to improve productivity: writing down what you’re thankful for increases happiness, and happiness increases productivity. Brad Dobson: Hi and welcome to Episode 127. Is it 127? Minette Riordan: Yeah. I hope so. Brad Dobson: Oh, did I commit? I guess we’re committed now. I think that’s right. Yeah, because this week is 126. Minette Riordan: Yes. So, talk about organization and productivity. Woo! And where’s our structure? We have a structure. Brad Dobson: Awesome. Today Dr. Minette Riordan and myself, Brad Dobson, we’re going to talk about the connection between gratitude and productivity. Minette Riordan: We are and I’m excited about the topic. So, here in the United States, it is Thanksgiving. It’s American Thanksgiving, because you Canadians celebrate yours at a different time. Brad Dobson: That’s right. And I need to remember that more often. Minette Riordan: Yeah, because we could celebrate it twice. We could have turkey twice. Brad Dobson: More turkey is better. That’ll make me more productive, I’m sure. Tryptophan. Brad Dobson: It’s a known productivity enhancer. Minette Riordan: Well, I don’t think so. Anyway, we’re going to be short and sweet today and just go with that classic November theme of gratitude, but with a twist, because it’s actually been proven that expressing gratitude can increase productivity. Minette Riordan: He doesn’t believe me. Brad Dobson: Yeah, I’m cynical. You got to prove this to me. Minette Riordan: Okay. Well, I did a bunch of research, right? Because you guys know I like to do the research and, problem is, he didn’t go read the research yet. Brad Dobson: Uh-huh. You sprung it on me. Minette Riordan: I did. I totally sprung it on him. So, first of all, here’s a great quote from a writer named Maria Hill. This was an article on Lifehack. And she says that gratitude puts us in more positive relationship to life and others around us. It separates our attitude from our circumstances so that our current reality does not drag us down. 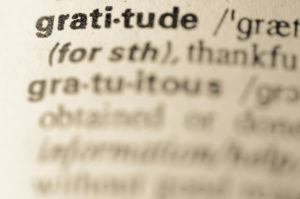 Gratitude is a way of being that lets us participate fully in life without concern for rewards and status. Minette Riordan: And so, what I love about that particular perspective and definition of gratitude is that it equals focus and mindfulness. And when we’re focused on what’s happening in the moment without getting bogged down by it, by noticing what it is that we’re grateful for and experiencing, then we can stay focused. And guess what? When we’re more focused, we’re more productive. Brad Dobson: So, I think of gratitude as, I’m going to be grateful for my great-aunt for baking a pie. Or I’m going to be grateful for … I don’t know … my paycheck. Or grateful for … I don’t know … my kid’s A plus on their test. Brad Dobson: I get that a lot. Minette Riordan: Not getting things done, right? If you take a moment to pause and to physically write down just a few things that you’re grateful for in the moment. Like you’re grateful for your awesome computer and your stand-up desk. Or you’re grateful you’re in partnership with your awesome wife. Or you’re grateful that you can go out for a bike ride at 10:00 in the morning or 4:00 in the afternoon, that you have the freedom and flexibility to do that. Minette Riordan: Right? It literally shifts your body and your mindset. It physically creates a serotonin release, I think, so that you feel happier and you feel calmer and you’re not bogged down and feeling dragged down by what’s not working. So, Brad and I play this game a lot about … It’s called the What’s Working Game, right? And sometimes you got to dig deep for, what’s going right, right now? What is working well? What is bringing you joy and excitement? What can you express gratitude for? And when you’re focused on what is working, then you have energy to look at, what do I need to do next to keep me moving forward? Brad Dobson: So, it’s that perspective shift that’s the most important part. Minette Riordan: I think so. Brad Dobson: As it relates to all the things that go wrong or cycling downwards emotionally or all that other crap. Minette Riordan: Yeah. And we can get into such a deep cycle of worry and fear. And we can get really focused on outcomes. And when we’re more focused on outcomes, we’ve lost sight of, what’s the one action I need to take right now, right? Minette Riordan: And this is normal to humans. Minette Riordan: Keeping us safe. Minette Riordan: Get a thousand awesome comments and then one really negative one. Brad Dobson: Right. One negative one and that’s the only one you’re focused on. And it’s actually because our brains are keyed to do that, right? We’ve got that fight or flight response. It’s our lizard brain responding and it’s our higher brain that is actually what we want to engage and bathe in all of the grateful comments. Brad Dobson: Oh, I wasn’t negative. Minette Riordan: It was about how gratitude journals can improve productivity, “supposedly,” right? That says something about the title of this article. And he actually dives into the research and it has been proven that when you write down the things that you’re grateful for, it makes you happier and when you feel happier, you are inevitably more productive. You have the energy, right? Because this is all about the emotional drag of not feeling good. And when we don’t feel good, physically or emotionally, it makes it really hard to stay in action. We just want to go to bed or binge on Netflix all day and eat Cheetos or Doritos or whatever your numbing habit of choice is. And gratitude gets us out of that feeling, that need to just totally numb out, and back into a place where we can take action. Brad Dobson: Yeah. I think this is … One of the problems I’m struggling with right now is that I feel like I have to work hard to get out of these ruts, whether it’s distraction or negativity or … It’s like I have to … There’s effort that I have to put in. I don’t feel like I can just live and be happy. I have to actually put effort into trying to get these things working. Brad Dobson: But it takes building a habit. Minette Riordan: It does. Absolutely. Gratitude is a habit worth cultivating, right? Brad Dobson: Yeah. Definitely, definitely. Minette Riordan: And you can do this around the dinner table with your kids and family. And one of the other pieces of research I found talked about how, in the workplace, expressing gratitude to your staff has a huge impact on their productivity, because when you acknowledge what it is that they’re accomplishing and what they’ve done well, they feel rewarded, they feel seen and witnessed, and then they’re excited to do the next thing. Minette Riordan: Because I tend to just like, “Okay, let’s keep going,” right? Minette Riordan: Instead of pausing for a moment to acknowledge and say, “Oh, my gosh. This is amazing. Thank you so much for getting this done”. Or if it’s not related to me, “Ooh, I’m so excited for you that you got this done”. Minette Riordan: And it’s funny, because I think it’s something you do naturally with your fitness and exercise where you have rewards and gratitude in the experience of reaching your fitness goals with training peaks. Brad Dobson: I might put those on the background of my screen, digital ones. Minette Riordan: Digital sticky notes. Brad Dobson: Instead of making a giant mess with them. Minette Riordan: I know you’re way more organized. We don’t have sticky notes all over the house. Piles of them, but not stuck up on mirrors and kitchen doors. Maybe we should. Maybe it would be better. Pause and take a breath before opening up the pantry cabinet to grab a snack. But handwritten notes to others or to yourself. Mailing yourself a love note, right? A gratitude note or other ways. They all involve the physical aspect of writing down what you’re grateful for. There’s something magical that happens in the brain when you take the time to, not just think about it, but to physically write it down, to read it back. And it’s really cool to keep a record of your gratitudes and then reflect back over time, especially when you’re having one of those extra hard days and you’d rather be watching Netflix than getting your work done. Brad Dobson: So, now you’ve got me thinking I want to systematize this. Minette Riordan: Well, it’s just like … you’re already journaling every day. Minette Riordan: So, especially in the evening journaling when you’re getting ready for the next day, what if you just added three things that you were thankful for? Minette Riordan: So building on habits that you already have. Brad Dobson: Maybe even more often than that. Minette Riordan: More frequently throughout the day? Minette Riordan: So, at the end of your focus box? Brad Dobson: Something like that. If I was actually doing the focus box. Minette Riordan: Brad’s in a rut. I think he needs a vacation. Brad Dobson: Yup, definitely. And Thanksgiving is a good time for that. Minette Riordan: We’re taking the week off. Minette Riordan: There’s no Christmas decorations? Brad Dobson: Yeah. Right. Giving thanks is actually one of the most important things that we can do and it’s a great reminder. Minette Riordan: It is. And giving thanks to others is important, but pausing to just notice, what are we personally grateful for? So, again, when you pause to reflect on what you’re grateful for, you feel more satisfied, you feel happier. And when you’re happier with how things are going in your life, it’s easier to have the energy and focus to increase your productivity. There is a direct correlation there. Its been proven, not by me, by other people. Brad Dobson: Couldn’t say it any better. Minette Riordan: We appreciate you. We’re very grateful for your listenership. We’re 127 episodes into this baby. It’s been a lot of fun. I’m grateful for you. Brad Dobson: I’m grateful for you. Brad Dobson: Love you guys! Minette Riordan: All right. See you next week!